Follow me on my journey to become a published author. I am a professional editor and an aspiring writer of both novels and short stories. I'm currently working with the web designer for my new site! I'm not positive when the migration of this blog will happen over to Wordpress, but it will likely be soon. Just a quick update-I'm still working with my web designer, and I'll still be migrating my blog over to Wordpress. She's also working on a new logo for me--I love what she's come up with so far! We recently moved into a new house and have been super busy unpacking, so I haven't been around online much. I'll keep you posted when I know more! The Zia Sun Symbol is commonly seen around New Mexico, even on their state flag. But where did it come from? The Zia people are an indigenous tribe, and they currently live on the Zia Pueblo outside of Albuquerque. The sun is considered a sacred symbol, and the Zia symbol design reflects the tribe's philosophy of harmony of all things in the universe. There are four rays in four directions on the Zia Sun Symbol, meant to show the four points on the compass, four seasons of the year, the four seasons of life (childhood, youth, middle age, old age), and the four sacred obligations one must develop according to Zia belief (strong body, clear mind, pure spirit, and devotion to the welfare of others). The state flag of New Mexico (pictured above) has the red Zia on a field of Spanish yellow, symbolizing both parts of the state's culture and heritage. I hope you've enjoyed these little snippets of New Mexican information! I've learned a lot about my new home (though there's a lot more out there) and I can't wait to explore my new home state. 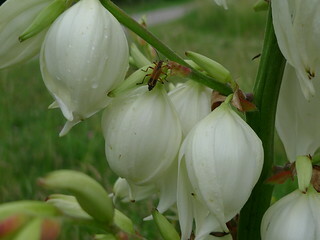 New Mexico's state flower is the yucca, and has been officially since 1927. There are about 40-50 species (including perennials, shrubs, and trees) and none are actually specified as the state flower. They're pollinated by a specific moth that goes from flower to flower and deliberately transfers the pollen from the stamen of one to the stigma of another, then lays eggs in the flower. The moth's offspring eat some of the developing seeds when they hatch. One of the most fun museums I've ever been to has to be Explora! (yes, it has exclamation points in its name), located on the west side of Albuquerque. It's an interactive museum--all of the exhibits are things you can touch and play with. Most of the topics are science and technology, and the different exhibits are fun to play with. Want to learn about aerodynamics first-hand? Try and float various items on a stream of air! Sound waves? Light? Gravity? Learn about all of these while interacting with objects and instruments. Even better, Explora! has special events like Adult Night. If you've ever been to a science museum and watched kids play with the children's exhibits, trying hard not to move them out of the way and play with the exhibits yourself, you're in luck--this is exactly what it's for. We had a blast making giant bubbles and playing with blocks without worrying we were going to get kicked out. If you want to have a fun day out, I totally recommend checking out Explora! Sandia, in Spanish, translates to "watermelon". So, the pretty Sandia Mountains are really the Watermelon Mountains. Because, at sunset, the Sandias turn a lovely pink shade in the fading light. Sorry I don't have a picture of it (it only lasts a minute or two, and I'm often not near my phone), but here's a great shot of the mountains. So I decided to do this extra post because my friend, Valency, is a talented artist and because she lives in New Mexico, it's perfect for my A-Z Challenge theme! Valency got her BFA degree at the University of New Mexico, and has been creating what she calls vegan taxidermy ever since. Her extraordinary pieces resemble, well, decapitated Dr. Seuss creatures, and each one is lovingly crafted to find their forever home. Some of her creations have gone to people from Pixar, and even Vincent Price's daughter took one home! She recently had a very successful show in Chicago, and I know she's creating new creatures for some upcoming events. If you like her work, she ships all over the world. Sarah is a writer who finally figured out what she wanted to do when she grew up. She writes both novels and short stories: contemporary romance, paranormal, erotica, and possibly horror if her imagination lets her. She is a member of the Romance Writers of America, and the Maryland Romance Writers chapter. Follow Sarah's board Writing Tips on Pinterest. Follow Sarah's board Editing Tips on Pinterest.